Sometimes, due to the extended use or overclocking, the computer’s fan runs faster than usual and creates noise. Fans are the crucial components on a computer system, as they help to prevent overheating issues in most cases by cooling down the CPU temperature. So, it is vital to keep the fan speed in control. 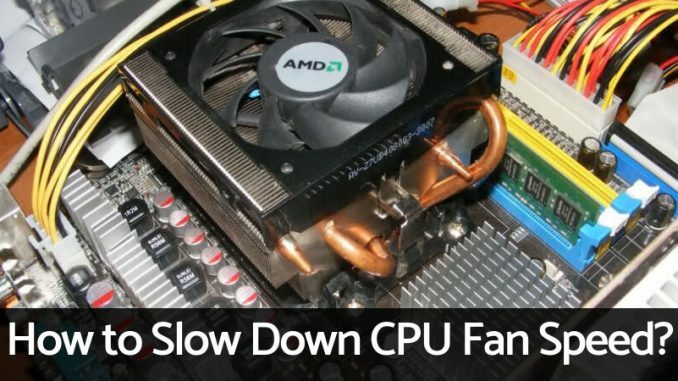 Today, we will look at the ways to slow down the CPU fan speed. The modern computer systems come with the PWM (Pulse Width Modulation) controller fans in which you can control the RPM for the cooling fans. If you feel that the system is facing the overheating issue, then you can increase the PWM fan speed to increase the airflow and cool down the processor. How to Slow Down CPU Fan Speed? There are several ways to control the fan speed of the CPU. We will see the best of them here. Turn off the PC and start it again. Open the BIOS menu when the screen shows the option for settings menu (It can be ‘Del,’ ‘F2’, ‘F12’, ‘F1’, ‘F10’, or ‘Esc’ depending on the system). Using the arrow keys, navigate through the BIOS menu and go to ‘Status’ or ‘Monitor’ or other similarly named option (depends on the manufacturing company). Select the fan of which you want to change the speed. From the drop-down list, choose the speed. Save the settings by pressing the ‘Enter’ key. Go back to the main BIOS screen, and click on ‘Exit.’ Choose the option of ‘Save Changes and Exit’ when asked. Restart your system if it does not reboot automatically. In the same way, you can set the speed of all the fans installed in your system. Note: The PWM controller will only let you change the fan speed from the predefined rated speeds. Press Windows key and type “control panel.” Open when you see it in the search menu. Click on the ‘Performance and Maintenance’ section. You will see various options including brightness, CPU processing, cooling method, etc. Here, ‘Cooling Method’ is the option we are looking for. You can see the slider bar in that option. The higher the bar setting is, the higher the CPU fan speed will be. Depending on the system performance, the cooling method is utilized to slow down the CPU. You can change this slider bar position to increase or decrease the fan speed. Click on ‘Ok’ button after you make the changes. You can also get help from the third-party application to control the fan speed. There are many PC applications available to do this process, but here I will explain you about ‘SpeedFan’ app. But, before I show you the procedure, I want you to keep in mind that this application does not work with every computer system. So, check its compatibility with the one you are using. Also, you should turn off the fan settings in BIOS menu to use the third-party speed controlling application. Download and install the app from its official resource. After the successful installation, open the application. A small window will appear on the screen, in which you will be able to see the information of the system fans, temperatures of GPU, CPU, Hard Drives, and other details. Click on the ‘Configure’ button to see the list of all the sensors on your system. You can even rename them to get a better understanding of the temperature and other details of them. To check the functionality of the app, you can configure the settings of the PWM fans of your system in the configuration window. Click on the ‘Configure’ button on the main window of the app. Now, go to ‘Advanced’ tab. In the Chip drop-down menu, select your system’s motherboard. Set the mode of all the PWM fans to ‘Manual’ if they do not have that setting. If you have multiple Chip menus, then do this process for all of them. Now, go to ‘Options’ tab. Mark the box of ‘Set fans to 100% on program exit’ option. The main screen of the app will reappear now. With the help of the arrow buttons, increase or decrease the speed of the PWM fans. You can see the change in RPM of the first listed fan. You may also hear the sound of the fan in your system when you make a big difference in the speed. You can rename the PWM fan names in the Configuration tab if you know which is the CPU fan in it. Select the PWM fan you want to rename and press ‘F2’ to enter a new name. Rename all the fans if you can identify their location and relevant name in the app. It will help you to analyze and manage the speed of the cooling fans efficiently. So, in this step, we have checked the working of the different controls of the ‘SpeedFan’ application. Now, we will customize them in the next section. After arranging all the fans and sensors in the system, we will now customize the fan speeds and set them up for better performance. Again, go to the Configuration window in the application. Navigate to the ‘Temperatures’ tab. 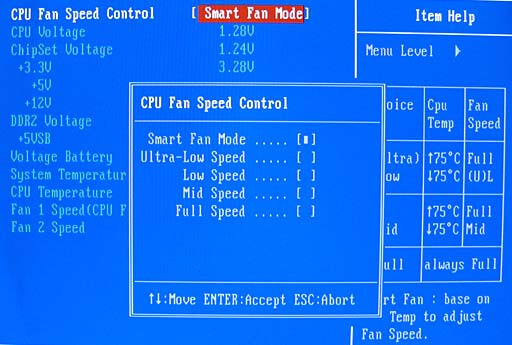 Here, you can set the speeds of the CPU fan and chassis fan to control the temperature of the system. To check the fans connected to a particular sensor, click on the ‘Plus’ sign next to it. Depending on your system working and your usage, set these both options. Repeat this process for every sensor that you wish to control. Now, go to ‘Speeds’ tab. Select the fan for which you want to set the speed. Both the values vary on the fan type and connected sensors. You can set the minimum value of a fan to 0 for making your CPU silent in routine work. But remember that not all PWM fans work at 0%. Mark the ‘Automatically Variated’ box and do this same thing for all the fans listed in the tab. Click on ‘Ok’ after you finish. Go back to the main screen of the app and mark the box of ‘Automatic Fan Speed’ option. Also, check the speeds of the fans that you have set in the configuration window. Note: You should set the minimum value of your cooling fans by considering the heatsinks and other cooling options on your system. If you do not have a large CPU heatsink, then set the value higher than 15%. You should keep the ‘SpeedFan’ app to run automatically every time you start your system. The constant noise of fans can distract you when you are using your computer system. It can even become annoying when you play games. So, it is good to control the speed of the CPU fans in the PC. Fans are the essential components in any computer system, as they help to cool down the temperature of the PC parts like the processor, hard disk, sensors, etc. Controlling the fan speed of your CPU will help you to increase the lifespan of the system by maintaining its good health. If you manage the CPU fan speed properly, then you can cool down the processor when it is necessary and get a silent operation when it’s not.